Jane Hart’s “Top 100 Tools for Learning 2009” — many of them free. Just when you think you’ve heard of them all, you see something new and intriguing that you just have to try! Jeff De Cagna’s “Top Ten 2010 Trends for Associations” includes not only some recurring themes, but new ones while identifying their risks and benefits. The E-Learning 24/7 Blog’s post “Here, Data Data Data” provides some crucial questions to ask your potential vendors when considering an LMS. See nearby links on this page for more great posts from them on related LMS topics. Lessons on Learning (LOL)’s post on “Managing Subject Matter Experts and Using Them as Learning Developers” might not sound relelvant, but substitute “volunteer facilitator,” or “member as a content leader” for “subject matter expert,” and you’ll see immediate connections. This is the first in a planned series of posts on working together with your content providers, so tune in and follow along. Tom Kuhlman’s Rapid eLearning Blog has been on my list of regularly read blogs for awhile, and his post on “Why eLearning is So Effective” is one of the best summaries of the advantages of online learning I’ve seen. It’s as complete as I can imagine such a list being, and is succinct to boot. If you’re looking for support to get buy-in for elearning, you MUST read this blog. One of the best resources I’ve found for delivering lots of current info across the range of elearning is Tony Karrer’s eLearningLearning site (which I get via RSS, making it much easier and faster to scan so many relevant blogs). Even so, their periodic “best” lists helps me to further hone in on the posts I might have missed. Here’s one for the Top 25 posts from the last two weeks of January. 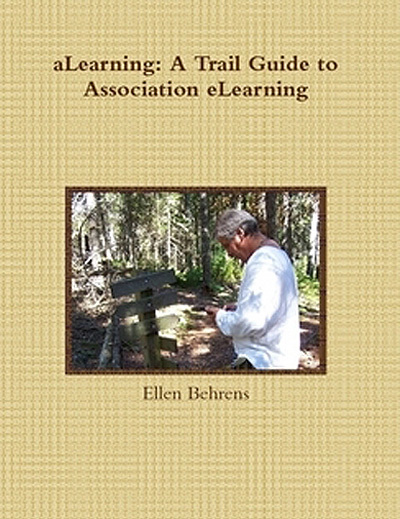 With many thanks to Tony Karrer, the aLearning Blog is being added to the eLearning Learning community. Not familiar with it? Check it out with a simple click in the lower right badge! Powered by Browse My Stuff, this is a very cool aggregate of all the latest elearning information in one spot. And it aggregates a LOT! Just a few days away and there are dozens of new posts from an array of sites. The set-up makes it easy to view through Google Reader so you can quickly scroll past the items that aren’t of interest or clear all if you’re really feeling behind. It’s hard to stay up to date on the latest when you there’s so much to keep track of. If you’re like me, I was reading about the foodservice industry (our association’s industry), membership, training and HR devlopments, elearning, meeting and events planning, management (budgeting and all that), communications and marketing… Anything that makes getting through the morass of information faster was a welcome thing. eLearning Learning’s feed of information will do that for you!